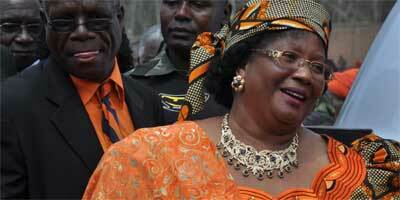 Malawi’s Vice President Joyce Banda says younger women have a ‘moral obligation to make it’. On an elegant veranda adorned with a red carpet, Malawi’s Vice President Joyce Banda recalls how her childhood friend Chrissie Mtokoma was always top of their class and how she struggled to beat her. But now decades later Banda is a likely contender for the country’s presidency in 2014, while Mtokoma lives in poverty. Later, both girls were accepted into prestigious secondary schools. But after just three months, Mtokoma was forced to drop out. As Banda entered adulthood, these childhood memories drew her attention to the benefits of education, and especially economic empowerment, to which she has dedicated much of her life. In recent years, Malawian women have made significant gains in their struggle for full gender equality. Women are increasingly represented in national politics, for example. Malawi’s May 2009 federal election saw the proportion of female Members of Parliament rise from 14 percent to 22. And though a minority, it is not difficult to find women’s names among the ranks of corporate board members. Yet women in Malawi remain disproportionately affected by poverty. In 2004, the National Statistics Office found that while only 25 percent of the country’s households were headed by women, they accounted for 58.4 percent of the country’s poorest homes. Moreover, women in Malawi remain significantly under-represented in areas of economic decision-making. Banda and other leading women argue that the key to addressing these problems is to put more of the country’s money in the hands of its mothers. Seodi White, national coordinator for Women and Law in Southern Africa, recalls her involvement in the country’s first marches for women, which were held in the late 1990s. More than a decade later, she argues that there is still much work to be done. Even small amounts of money can create life-changing opportunities for the country’s most disadvantaged women, White says. She describes the results of an experiment her organisation led in a village in Mangochi District. Women were given roughly 110 dollars and left to do with it as they wished. “We found out that these are not idle hands,” White says. One woman made sweets out of sugar and sold them to nearby schools. Another baked and sold small cakes. And a third invested in a tobacco operation. The women made enough to keep their small businesses going, and invested excess earnings in purchases that benefited their families; blankets for their children, iron sheets to improve a dwelling’s thatched roof, and household items such as salt and sugar that previously were only provided by their husbands. “This kind of power can create a level of decision-making at the family and community level that can have cascading effects on the country,” White emphasises. She points to studies by financial institutions such as Bangladesh’s Grameen Bank, which, time and again, have shown that women are significantly more likely than men to invest in areas that alleviate poverty such as health, education, and business improvement. At the side of the road in Blantyre, a group of women selling scraps of plastic discuss what they wish for their businesses. At the top of everyone’s list is an investment or small loan. Cecelia Goba, 40, and Ellen Mawuwa, 35, say that they would use funds to import and resell goods from neighbouring countries such as Mozambique. A number of non-profit organisations are active in Malawi supplying the sort of micro-loans made famous by the Grameen Bank and Nobel Peace Prize winner Muhammad Yunus. And the vice president’s newly-formed People’s Party recently launched an initiative called Orange Achievers, which aims to maximise the economic potential of Malawian women. But supply cannot meet demand. And as Mary Malunga, executive director for the National Association of Business Women, explains, there are a host of other challenges Malawian women must overcome if they are to excel in the professional world. Malunga, a successful businesswomen herself, offered a few words of advice. White echoes Malunga’s remarks. “Determination, determination, determination,” she emphasises, warning that this may mean sacrificing other aspects of one’s life, including having a boyfriend. Falling pregnant may end a young girl’s dreams. And at the vice president’s compound in Blantyre, Banda reiterates that economic empowerment is the path to education and prosperity. But she stresses that this does not mean anybody should wait for a handout.